DUBAI â€” Al-Qaeda chief Osama bin Laden lectured the United States and other industrial nations on climate change and urged a dollar boycott over US "slavery," in a new verbal assault broadcast on Friday. In the message aired on Al-Jazeera television, possibly timed to coincide with the World Economic Forum in Davos, bin Laden said "all industrial nations, mainly the big ones, are responsible for the crisis of global warming." "Discussing climate change is not an intellectual luxury, but a reality," he said in the audio recording whose authenticity could not be immediately verified. The Al-Qaeda chief condemned the administration of former US president George W. Bush for refusing to sign the Kyoto protocol on cutting carbon emissions. "Bush... and the Congress before him, rejected this agreement, only to satisfy the big companies," he said. "Those (firms) are behind speculation and monopolies, and rises in prices... and they are behind globalisation and its tragic results." Bin Laden also slammed financial bailouts set up by wealthy countries to help big industry cope with the global financial crisis, saying the programmes helped companies that caused the economic meltdown. "When those perpetrators fall victims to the evil they had committed, the heads of states rush to rescue them using public money," he said. He also borrowed from prominent American leftist Noam Chomsky, saying the US administration operates like the mafia. "Chomsky was right when he pointed to a resemblance between American policies and the approach of mafia gangs. Those are the real terrorists," said bin Laden. He was apparently referring to comments made in British newspaper The Guardian in November by Chomsky, a linguistics professor famous for his attacks on US policy. The Al-Qaeda leader went on to urge a boycott of the US dollar. "We should stop using the dollar and get rid of it... I know that there would be huge repercussions for that, but this would be the only way to free humankind from slavery... to America and its companies," he said. "Whatever the repercussions of such (boycott) decision would be, staying in slavery to them would have bigger and more dangerous results." In a translation provided by the US-based SITE Intelligence Group, bin Laden compared the US economy to a bicycle wheel. "If it loses a link in its chain, it stops running... If the peoples of the world stop consuming American products, this link will become more vulnerable, and this leads to the reduction of harmful gases," he said. The broadcast came less than a week after bin Laden in another audio message praised as a "hero" Nigerian national Umar Farouk Abdulmutallab who allegedly tried to detonate explosives on a US plane approaching Detroit on Christmas Day. "The message that was conveyed through the (attack on the) plane... is that America should not dream of security until we enjoy it as a reality in Palestine," he said in the message aired on Sunday by Al-Jazeera. The authenticity of that statement is also yet to be verified, but IntelCenter, a US group that monitors Islamist websites, said it appeared to be the voice of bin Laden. US President Barack Obama said bin Laden's decision to claim the attempted plane attack on December 25 showed the Al-Qaeda leader had been "weakened." The State Department said bin Laden was seeking "glory" by taking credit for incidents around the world. 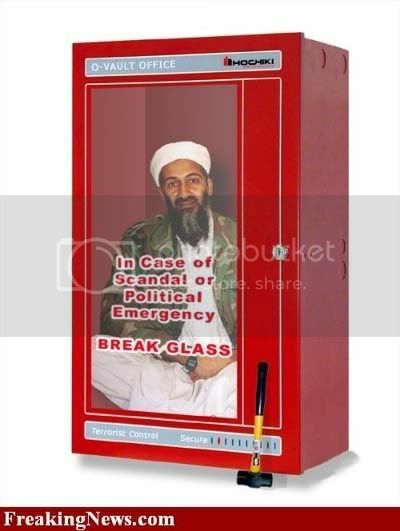 Bin Laden has a 50-million-dollar bounty on his head and has been in hiding for the past eight years. He is widely believed to be holed up along the remote mountainous border between Pakistan and Afghanistan. His latest message sparked a guessing game on Twitter as to what he will address on his next tape, with one user predicting he will tell the world "he can't wait to get his hands on an iPad," the latest creation from Apple. All this guy needs to nail down his true identity is to reveal that he "did it for the lulz". Well it's great to hear that OBL is really a globalist in favor of the NWO, the global warming scam and one world government, even if he is still against the Fed and a closet gold-booster.. It must really upset Glenn Beck that his enemy hero isn't a "truther", but maybe that just goes with the territory. Certainly he must feel a lot of "heat", wherever he is, so certainly all of these new, strangely inconsistent "revelations" have more mundane explanations. Anyone who believes that this "tape" has any provenance to the original genuine al CIAduh operative, OBL is missing an entire set of brain-mounting hardware. LOL yeah it only is a matter of time before OBL starts doing commercials from his imaginary cave.